Consider the following: what would you do if you were standing at a street corner waiting for the light to change, and two young men walked up to you, pulled a gun and ordered you to produce your wallet? I suspect most of us would comply. We would give up our wallet, although not our sense of outrage, out of a sense of outrage, out of a sense of self-preservation. The armed men have the power to compel us to do their will. We many not know the men at all, but force speaks. But suppose these two young men were wearing the uniforms of our local police department? We see on their shoulder a patch naming the department. They have a nameplate above their breast pocket announcing their last name. They appear to be clean cut and reasonably well-spoken. Although we would still be alarmed and unhappy to be looking down the barrel of their guns, we would comply with the command to produce our wallet. At some level, we would accept that these men had not just the power to compel us to do their will, but also that the police officers had the right to compel us to act. In the case of the two young men at the street corner, we comply with their show of force because they have the apparent power to cause us harm. We comply with the police for similar reasons, but there is more to their show of force: we acknowledge their authority to use force. The difference between mere power and authority is a sense of legitimacy. We say of the state that it has a monopoly on the legitimate use of force. But we say far more than that in the United States. We say that authority is exercised in our name, in the name of We the People. The Preamble to the federal Constitution begins with those words. Our Bill of Rights guarantees us rights that the government is not supposed to be able to trample upon. These rights are not self-enforcing, however. If they are to mean anything at all, we the people must have a place where we can go to make government listen, and to hold government accountable. It’s not enough to vote every couple of years, especially if all the men and women running for office start to look and sound the same. We the people need a place to turn to be heard in the day-to-day matters of importance to us in our communities. I say that the courts can be and should be such a place. In a healthy republic, we would say that the police officer acted in our name when he pulled a gun to stop and question someone. We have authorized his action in a way we never would the drug lords. But my sense is that we are a long way from healthy as a society. We have permitted police officers to become as unaccountable as the giant corporations they protect. When a banker comes to take our home on behalf of an investor betting against our success, the banker is often accompanied by a police officer. Who authorized this turning of our guns against ourselves? I did not. Did you? Ordinary Americans should be able to turn to the courts for relief. We should be able to make our case for justice in front of an ordinary jury of our peers. We ought to be able to say to the corporation that fouling our waters creates an obligation to clean them, that being too big to fail means that you must ensure we succeed. We ought to be able to say to a police officer that using high voltage to prod us like cattle from one spot to another is wrong. Juries should be able to say to judge, prosecutor and lawmaker that some laws don’t make sense. But the courts are out of control and adrift just now. Judges have assumed powers in the name of the people that we have never given them. Jurors are lied to and misled. Lawmakers refuse to be accountable for the consequences of what they do in the courts. Lawyers grow fat, sassy and increasingly disengaged from the pursuit of justice. 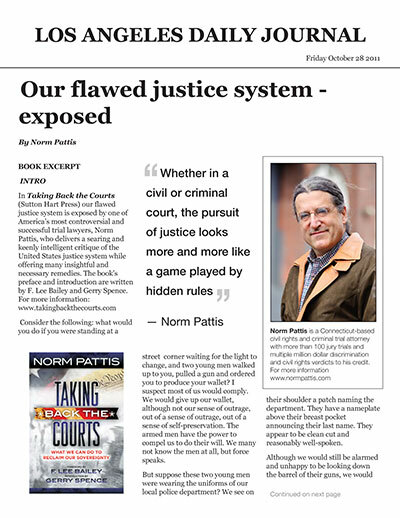 Whether in a civil or criminal court, the pursuit of justice looks more and more like a game played by hidden rules. All this and more is done in the name of you the people. What do you say we do something about it, you and I? The first step in reclaiming the courts is understanding that a courtroom is a place of public terror. It is where strangers face one another in contests that often determine what becomes of them and their fortunes. The courtroom is the place in our society where we try to transform naked power into authority. Force is applied in a courtroom, and that force is supposed to be the people’s force, force applied in your name. If you are unhappy with what you see taking place in the courtrooms of this nation, you should be as outraged as you would be if you saw your church desecrated or your home invaded by strangers. In the United States we claim the Constitution is a document reflecting our shared sense of right. The Constitution is not a mere contract binding strangers together in a common enterprise. Rather, the Constitution is a shared commitment creating a community. But who decides what the Constitution says or what it means? What role do the people have in defining and redefining common visions uniting strangers under the law? Did we the people really rebel against a distant overlord, declare our independence, create a new Constitution and then decide to walk away from that creation, leaving it in the hands of others to interpret? We certainly behave that way.